Why do humans chose to live where disasters are prone to happen? Are natural disasters becoming worse or are their other factors in play? Are you prepared for the natural disaster you are expected to experience in your region of the world? Because of the scientific method, we understand why most natural disasters occur and where. For example, because of the theory of plate tectonics, we know understand why nearly 90 percent of all natural disasters occur in the Pacific Ocean called the Ring of Fire. That same theory has helped to explain why some volcanoes are more explosive than others. We also understand that different tectonic plate boundaries produce different fault lines and thus different types of earthquakes. Natural hazards also have seasons - especially those controlled by external forces. The United States has more tornadoes than the rest of the world combined and mostly occur in the spring. Landslides are also most prone in the spring when snow begins to melt and over-saturate the ground. Wildfires are common in the middle of summer when the land is dry and thunderstorms tend to produce lightning without any precipitation. And hurricanes tend to peak in late August and into September when the ocean is warmest. Since hazards are predictable in some manner, it becomes important to develop some kind of warning system. Predictions, such as weather predictions, state that it will occur at a specified time, date, and intensity. It is like saying a major snowstorm will reach Salt Lake City at 4:30 PM for the commute home. Now a forecast is slightly different. A forecast states a probability of something occurring; such as a 40 percent of showers today. Forecasts are much more broad than predictions. One final note I'd like to discuss is the difference between a watch and a warning. A watch is issued when the conditions for a particular event are right. So if a thunderstorm is strong enough and rotating, it is possible that a tornado may form. Or if an earthquake with a magnitude of 7.5 strikes somewhere in the ocean, a tsunami watch may be issued because the earthquake was strong enough to create one. But a watch does not mean that it will occur. But is a tornado is spotted on the ground or a ocean sensor records an approaching tsunami, then a warning is sent out to the areas that could be impacted. In order to understand how to prepare for a natural hazard, a risk assessment must be conducted. The risk of a potential hazard is defined as "the product of the probability of that that event occurring times the consequence should it occur." It is important to determine the potential risk a location has for any particular disaster in order to know how to prepare for one. Referring back to Salt Lake City again, the probability of an earthquake occurring anytime soon is small, but the consequences to human lives and destruction are very high. Thus there is a high risk of an earthquake striking Salt Lake City. One of the limiting factors of risk is knowing the probability of a disaster. Too often scientific data is lacking to data as to how often a disaster occurs for a particular location. In the summer of 2008, China was rocked by a magnitude 8.0 earthquake that killed over 80,000 people. A week earlier a cyclone struck Burma killing 130,000. On January 12, 2010 a magnitude 7.0 earthquake killed nearly 300,000 people and leveled the capital city of Port-a-Prince. On March 11, 2011 a magnitude 9.0 earthquake generated a tsunami off the coast of eastern Japan killing 30,000 people. Are natural disasters getting worse? Not really, humans are overpopulating the place. Over the last 70 years, the world's population has tripled to 6.7 billion. 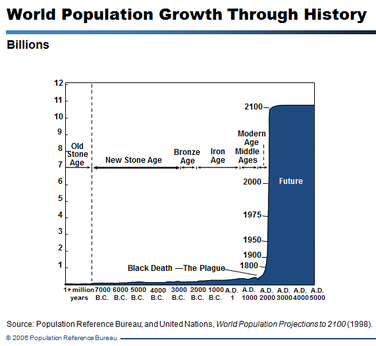 It is expected by exponentially grow and by 2050 the world's population will reach 9 billion. Exponential growth means the world's population will not grow linearly (in a straight line), but rather as a percent. Our increased population size has caused air quality to suffer, reduced the availability of clean drinking water, increased the world's extreme poverty rate, and has made us more prone to natural hazards. There is also a relationship between the magnitude of an event (energy released) and its frequency (intervals between episodes). The more earthquakes that occur for a particular location, the weaker they tend to be. That is because built-up energy is slowly being released at a fairly constant rate. But if their are long intervals between one earthquake and the next, the energy can build and can ultimately produce a stronger earthquake. That is the problem with earthquakes along the Wasatch Front of Utah. The interval or frequency between earthquakes tends to be 1,500 years, so the magnitude tends to be high because of the built-up energy. At some point we are going to want to get this earthquake over with because the longer it waits the worse it will be. Now there are two types of effects caused by natural disasters: direct and indirect. Direct effects, also called primary effects, include destroyed infrastructure and buildings, injuries, separated families, and even death. Indirect, sometimes called secondary effects, are things like contaminated water, disease, and financial loses. In other words, indirect effects are things that happen after the disaster has occurred. How we chose to build our cities will greatly determine how many lives are saved in a disaster. For example, we should not be building homes in areas that are prone to landslides, liquefaction, or flash floods. Rather these places should be left as open-space such as parks, golf courses, or nature preserves. This this is a matter of proper zoning laws which is controlled by local government. Other ways we can reduce the impact of natural disasters is by having evacuation routes, disaster preparedness and education, and building codes so that our building do not collapse on people. A hazard is any natural process that poses a threat to human life or property. The event itself is not a hazard; rather, a process becomes a hazard when it threatens human interests. A disaster is the effect of a hazard on society, usually as an event that occurs over a limited span in a defined geographic area. The term disaster is used when the interaction between humans and a natural process results in significant property damage, injuries, or loss of life. The earth consists of three layers: an inner and outer core, the mantle, and two types of crust. 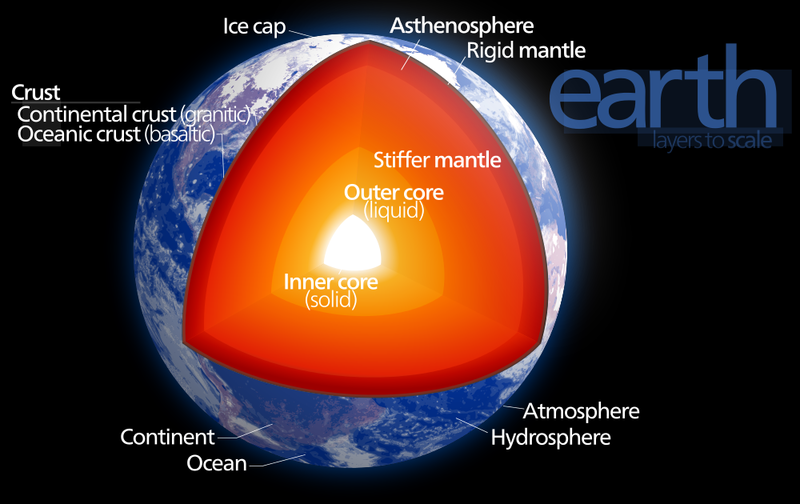 The earth's core consists of two parts: a liquid outer core and a solid inner core, both made of iron and nickel from the early make-up of the planet, and where the temperatures can range from 8,600 degrees to 9,600 degrees Fahrenheit. The next and largest layer is called the mantle, which makes up two-thirds of Earth's mass. The mantle is actually called a plastic solid, which means it has the ability to flow very slowly. Heat from the earth's core causes the mantle to convect, like water over a stove but much slower, and it is the mantle's convection that is the driving force of plate tectonics. The surface layer of the earth is called the crust and it makes up only 1 percent of Earth's mass. The crust is subdivided into two components: oceanic and continental crust. Again referring back to the image on the right, note that the oceanic crust is only about 3 miles thick, but is slightly more dense than continental crust. Most of this oceanic rock is called basalt and is a dark, dense rock. Continental crust is much thicker than oceanic crust (averages between 20 to 25 miles thick), but is actually slightly less dense than oceanic crust. The main type of rock on continents is called granite. So if these two types of crust were to collide into each other, what do you think would happen to the oceanic crust? As a whole, notice that the crust is lighter than the mantle. It is sometimes said that the crust "floats" on the mantle like an iceberg in water and that is not too far from the truth and is called isostacy. Finally, the crust is the coldest, most rigid, and brittle layer with lots of folds and fractures. The driving force of earthquakes and volcanoes is described in the theory of plate tectonics. The theory states that the earth is made of several tectonic plates along with several smaller plates. Each tectonic plate consists of oceanic and continental crust that move around the earth's surface like bumper cars because of convection within the mantle. The theory also explains that the majority of earth's earthquakes and volcanoes occur along the boundaries of these tectonic plates as they either grind past or underneath each other. 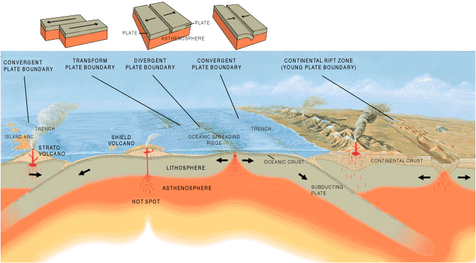 There are three major types of tectonic plate boundares: convergent, divergent, and transform. Let's first look at convergent plate boundaries, which can be broken down into three subcategories. Recall that oceanic crust is denser than continental rock like granite. Thus when two tectonic plates collide, the denser oceanic crust will subduct underneath the lighter continental crust. If the subducting rock becomes stuck, vast amounts of energy builds up. But once the pressure and energy is too great, the rock will rupture creating powerful earthquakes. As the subducted material sinks further, it will begin to melt under great heat and pressure, becoming less dense as it melts, and rise up as magma to form dangerous composite volcanoes. Mountain ranges created by oceanic-to-continental convergence are the Andes mountains in South America, the Cascades in the western United States, and the Ring of Fire in the Pacific Ocean. 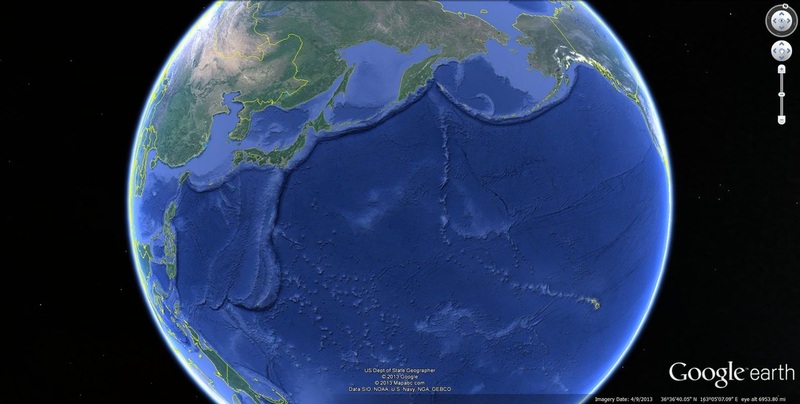 Below is a Google Earth image showing a series of oceanic-to-oceanic subduction zones within the Pacific Ring of Fire. 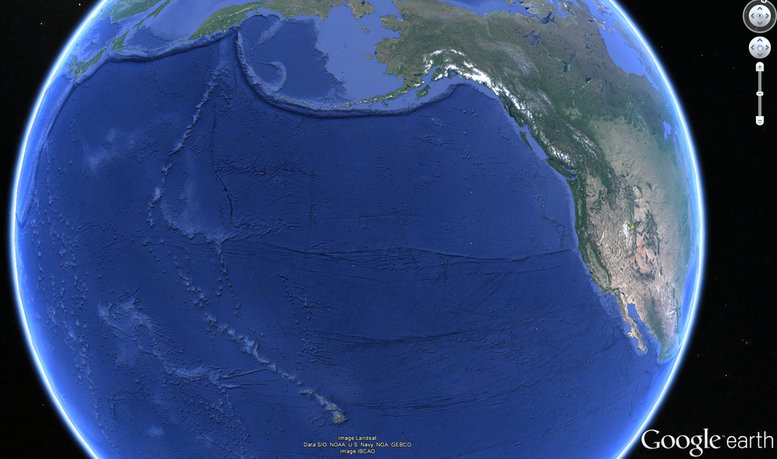 You can visibly see the subduciton zones that create the volcanic and powerful Aleutian Islands and the converging subduction plates that make of volcanic islands of Japan. With oceanic-to-oceanic convergence, the heavier of the two will subduct down beneath the other. Just like continental-to-oceanic convergence, this plate boundary can generate powerful earthquakes and volcanoes; but instead of volcanoes on land, volcanic islands form such as Japan, the Aleutian Islands of Alaska, and Indonesia. The great earthquake in Indonesia in 2004, which produced the devastating tsunami, was created by this process along with the 2011 earthquake and tsunami in Japan. When two continental plates converge, instead of subduction, the two similar tectonic plates will buckle up to create large mountain ranges like a massive car pile-up. This is called continental-to-continental convergence, and geologically creates intense folding and faulting rather than volcanic activity. 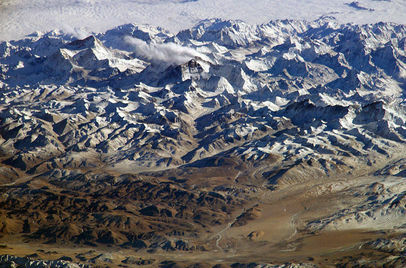 Examples of mountain ranges created by this process are the Himalayan mountains (taken from the International Space Station) as India is colliding with Asia, the Alps in Europe, and the Appalacian mountains in the United States as the North American plate collided with the African plate when Pangea was forming. The Kashmir India earthquake of 2005 that killed over 80,000 people occurred because of this process. And most recently, the 2008 earthquake in China which killed nearly 85,000 people before the Summer Olympics was because of this tectonic force. When two tectonic plates move away from each other, or when a tectonic plate tears itself apart, divergent boundaries can form. As divergence occurs, shallow earthquakes can occur along with volcanoes along the rift areas. When the process begins, a valley will develop such as the Great Rift Valley in Africa. Over time that valley can fill up with water creating linear lakes. If divergence continues, a sea can form like the Red Sea and finally an ocean like the Atlantic Ocean. 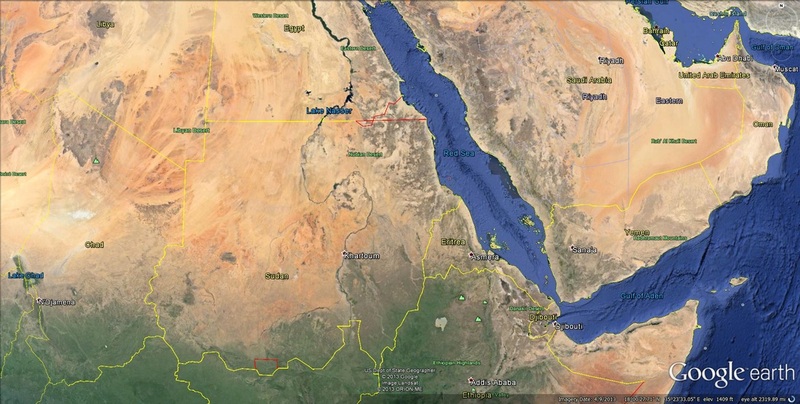 Check out the eastern half of Africa and notice the lakes that look linear. Eastern Africa is tearing apart from these linear lakes, to the Great Rift Valley, and up to the Red Sea. Notice how the Red Sea looks like it could be put back together again. The ultimate divergent boundary is the Atlantic Ocean, which began when Pangaea broke apart. 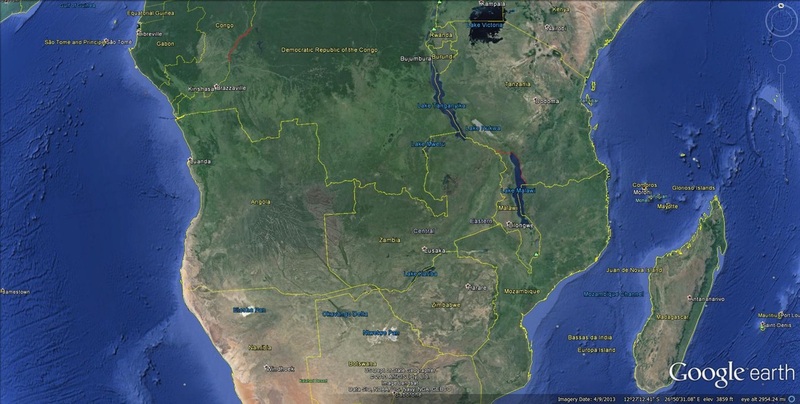 Below are two satellite images using Google Earth, both focusing on parts of Africa. On the left yo can see rift valleys that have filled in with water to form linear lakes. On the right in northern Africa, you can see the Red Sea with a rift valley in the center, which use to be a linear lake that grew into a sea. If the Red Sea continues to grow, it could form an ocean similar to the Atlantic Ocean with the mid-Atlantic Ridge. Transform boundaries occurs when two tectonic plates slide (or grind) past parallel to each other. 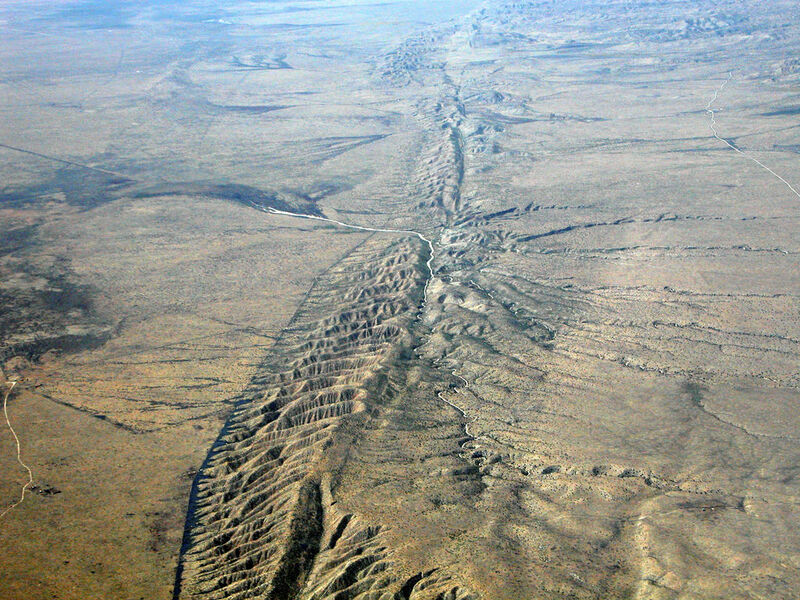 The most famous transform boundary is the San Andreas Fault where the Pacific plate (that Los Angeles and Hawaii are on) is grinding past the North American plate (that San Francisco and the rest of the United States is on) at the rate of 3 inches a year. Recently, geologists have stated that San Francisco should expect another disastrous earthquake in the next 30 years. Another important transform boundary is the North Anatolian Fault in Turkey. This powerful fault last ruptured in 1999 in Izmit, Turkey which killed 17,000 people in 48 seconds. 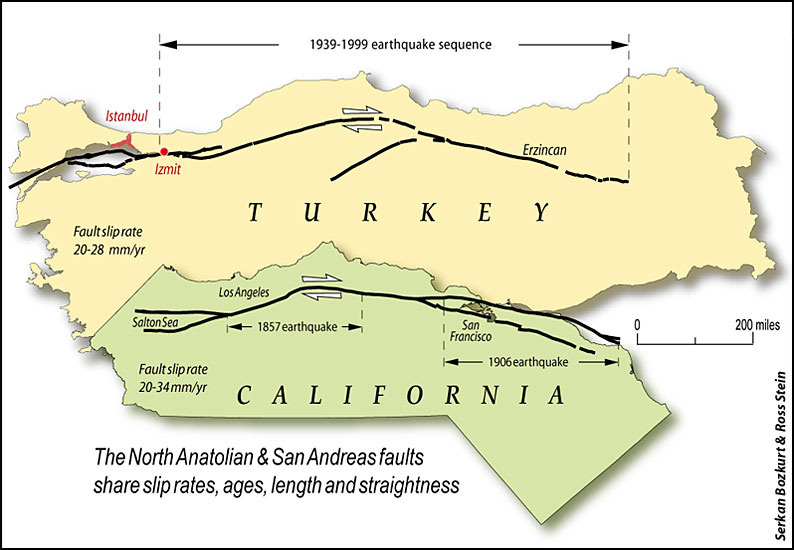 Comparison of the San Andreas Fault, CA and the North Anatolian Fault in Turkey. Both are located along transform boundaries. Image source: United States Geologic Survey (USGS). An earthquake is a sudden motion or trembling in the earth caused by the abrupt release of slowly accumulated energy. All earthquakes occur along a fault, which is a fracture in the earth's crust where tectonic movement occurs. Where the actual break occurred along the fault is called the focus (also called the hypocenter) and the epicenter is the point on the Earth's surface that lies directly above the focus and is where the strongest shockwave is normally felt. Click here to watch a brief video on earthquakes. Recall that all around the planet, tectonic plates are moving because of convection in the mantle. 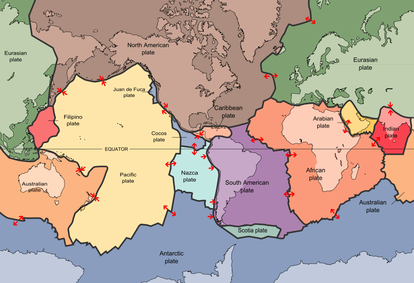 Tectonic plates are also composed of two types of crust, oceanic and continental. The oceanic crust, which is made mostly of basalt is more dense than continental crust that is made of granite. When these tectonic plates come in contact, the denser oceanic crust subducts below the continental crust. Now sometimes when two tectonic plate come in contact they become stuck. As the rocks begin to bend or strain under tectonic forces, large amounts of energy, called strain, builds. When the stress becomes too great for the rocks to hold, segments may suddenly snap, releasing large amounts of energy, called the elastic rebound theory. There are several types of faults that earthquakes occur on, which are dependent on whether the fault is occurring because of convergent, divergent, or transform tectonic plate forcing. Geologists use old mining terms to distinguish between different types of faults. Think of a minor walking down into the earth along a fault line. The ground the miner is walking on is called the foot-wall. If the minor needs to hand their lantern, the ceiling is called the hanging-wall. Strike-slip faults (A) occur along transform boundaries where tectonic plates are moving horizontal or parallel to each other. Deformation of rivers, roads, fences, etc. can occur if they cross over these fault lines. Examples of strike-slip faults are the San Andreas Fault in the United States and the North Anatolian Fault in Turkey. Normal faults (B) are common along divergent plate boundaries. As extensional forces occur, the foot-wall is forced upward, while the hanging wall slides downward. This can create a series of valleys (called a graben) and mountains (called a horst). Examples of mountain ranges and valleys created by normal faulting are the Grand Tetons, the Basin and Range in the western United States, and the Wasatch Front in Utah. 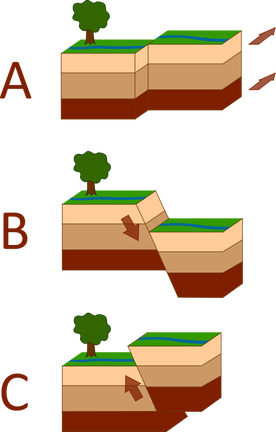 Reverse faults (C) are caused by compressional forces as tectonic plates collide together forcing one plate to rise above another. Using the mining terminology, movement along a reverse fault would cause the hanging-wall to rise up and the foot-wall to drop lower. The angle of a reverse fault is about 45 degrees, but if the angle of the fault is steeper than 45 degrees it is called a thrust fault. When two plates collide, intense folding and faulting can occur. Examples of where reverse and thrust faults occur are where convergent boundaries are common such as: the Northern Rocky Mountains, the Alps, Himalayas, and the Appalachian mountains. Earth is made up of a series of tectonic plates, each consisting of oceanic basalt and continental granite. Now because of convection within the mantle, new oceanic crust is created at divergent boundaries creating oceanic ridges. Where tectonic plates converge, the denser oceanic basalt subducts below the lighter continental granite. As the oceanic crust subducts deep enough it begins to melt under great heat and pressure to form molten rock called magma. The molten rock is less dense than the surrounding rock and thus rises to the surface to create volcanoes. Magma cools into rock much slower than on the surface because the heat gets trapped. Because of this, when magma reaches the surface, geologists call it lava. Shield volcanoes tend to be the tallest volcanoes - and even the tallest mountains - in the world. These volcanoes tend to have gentle slopes with an arc in the shape of a Roman shield. It is their low viscosity lava flows that produces the gentle slopes. Eruptions tend to be mild in comparison to other volcanoes, but lava flows can destroy property and vegetation. The low viscosity magma can flow not only on the surface as lava, but also underground in lava tubes. 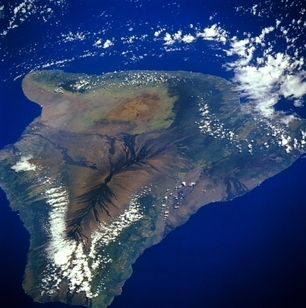 The most well known shield volcano is Hawaii. There are two types of lava flows, pahoehoe which is a ropy type of lava that flows easily (low viscosity). The other type is called aa and is a blocky type of lava and has a higher viscosity and does not like to flow well. 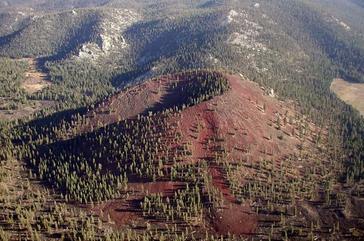 Cinder cone volcanoes are the smallest type of volcanoes ranging from 300 to 650 feet high. The volcano is built up by eruptions of solid pyroclastic material, specifically tephra, along the volcanic neck. 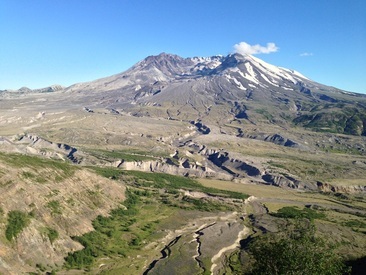 Many people live near cinder volcanoes because the weathered pyroclastic material becomes fertile soil for agriculture. These volcanoes kill few people, but can destroy property. Composite volcanoes are some of the most dangerous volcanoes on the planet. They tend to occur along oceanic-to-continental and oceanic-to-oceanic convergent boundaries which produces highly viscous pyroclastic material that erupts violently when it reaches the surface. They are also called stratovolcanoes or andesite volcanoes because they erupt volcanic rock - called andesite - which builds up the volcano followed by lava which holds the material in place. This creates stratified layers within the volcano. Examples of composite volcanoes include Mount St. Helens, Mount Rainer, and Mount Pinatubo. Here's a great time-lapse of Mount St. Helens from NASA's Earth Observatory from 1979 to 2013. Composite volcanoes and other violent volcanos can erupt so violently that they sometimes collapse in on themselves or actually blow themselves up to produce calderas. One of the most powerful volcanoes in the world - Yellowstone - is a massive caldera that has collapsed several times. 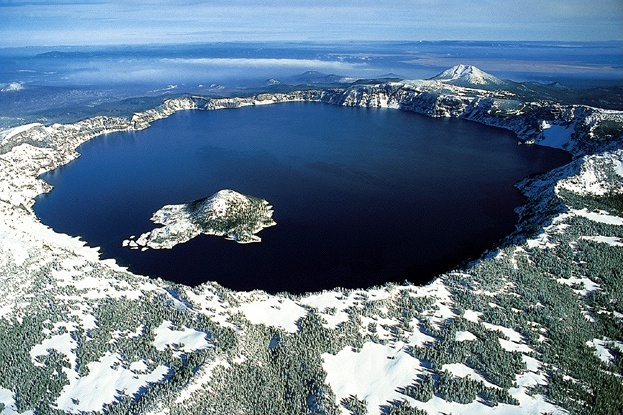 Sometimes these calderas can fill up with water to produce beautiful lakes such as Mount Mazama (Crater Lake), in Oregon. The theory of plate tectonics could never explain why some volcanoes form away from any tectonic plate boundaries. These anomaly volcanoes are called hot spots. Instead, they tend to form within tectonic plates in areas where the lithosphere is weak, which allows magma to rise up to the surface to create volcanoes. Though convection within the mantle causes tectonic plates to move, the hot spot does not. The hot spot stays stationary while the tectonic plate moves across it. Examples of hot spots include Hawaii and Yellowstone. 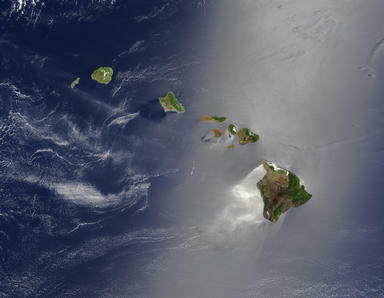 Hawaii is a shield volcano on top of a hot spot. It is a series of volcanic islands that have been created as the Pacific Plate has moved across the hot spot. Hawaii has gentle slopes and is the most active volcano in the world. Atmospheric processes and energy exchanges are driven by Earth's energy balance and linked to climate and weather. Hurricanes, thunderstorms, tornadoes, blizzards, ice storms, dust storms, heat waves, as well as flash flooding resulting from intense precipitation, are all natural processes that are hazardous to people. These severe hazards affect considerable portions of the planet and are responsible for causing significant death and destruction each year. The number one weather related cause of death in the United States are flash floods. The National Weather Service states that "flash floods are short-term events, occurring within 6 hours of the causative event (heavy rain, dam break, levee failure, rapid, snow-melt and ice jams) and often within 2 hours of the start of high intensity rainfall. A flash flood is characterized by a rapid stream rise with depths of water that can reach well above the banks of the creek. 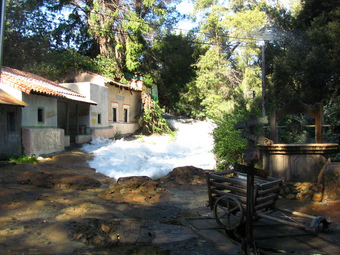 Flash flood damage and most fatalities tend to occur in areas immediately adjacent to a stream or arroyo. Additionally, heavy rain falling on steep terrain can weaken soil and cause mud slides, damaging homes, roads and property." Urbanized areas are susceptible to flash floods because soil and vegetation are removed and replaced by concrete, roads, and buildings. When intense precipitation occurs, the water has nowhere to go. Learn more about flash floods from the National Weather Service. 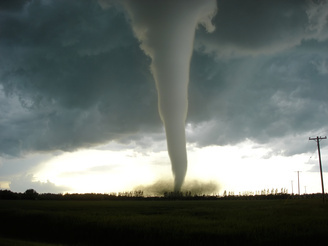 One of the most violent and destructive forces of weather are tornadoes. The NWS states that "a tornado is a violently rotating (usually counterclockwise in the northern hemisphere) column of air descending from a thunderstorm and in contact with the ground." They range in size from 300 feet to over two miles wide, last minutes to hours, travel a few miles to over 250 miles, at speeds of 30-65 mph. About 75 percent of all the tornadoes in the world occur in the United States; in fact the United States has more tornadoes than the rest of the world combined in a region of the central plains called Tornado Alley. What makes tornadoes so destructive are the wind speeds within them. Atmospheric pressure within a tornado can be 10 percent lower than the air surrounding the tornado, causing air to flow into the tornado from all directions. As the air flows into and up a tornado, the moisture begins to cool and condense into a cloud allowing the tornado to be seen. Debris picked up by the tornado will also cause it to darken. National Geographic has a great interactive website on tornadoes called Forces of Nature. November 2013 has had a series of intense storm systems in the United States and the Philippines. The video on the right is of the massive tornado outbreak of on November 17, 2013 in Illinois. It is believed that an incredible 70 tornadoes struck the region. To view an interactive map of the devastation by the Weather Channel, click here. Tropical cyclones are considered some of the most powerful weather systems on the planet because of their size, strength, and potential loss to life and property. Tropical cyclones go by different names depending on geography; in North and Central America they are called hurricanes, in the northwestern portion of the Pacific Ocean near China and Japan they are called typhoons, and in the Indian Ocean and Australia they are named cyclones. They all have winds exceeding 74 mph, can be hundreds of miles wide, and tower over 40,000 feet above sea level. 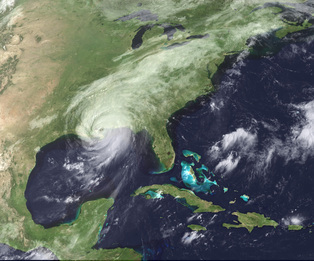 Tropical cyclones require warm ocean waters and humid moisture along with a low pressure system to generate the most powerful storms on the planet. Scientists are concerned that warming ocean temperatures, currently being recorded by satellites using infrared technology, could lead to more powerful storm systems like hurricanes. Another very real and recent event in disaster history is the recent destruction of the Philippines by Typhoon Haiyan in November 2013. In general, typhoon are more powerful than hurricanes and Typhoon Haiyan was the most powerful typhoon ever recorded. The latest tally of the devastation from the typhoon is that 13 million were directly affected, over 4 million displaced by the storm, over 2 million need food assistance and it is believed that 7,000 are dead. To view a series of maps and satellite images from the Washington Post, click here. Living with potential natural disasters and catastrophes is just part of living on Planet Earth and as human populations continue to grow and living in disaster prone regions, the social and economic risks will continue to rise. Natural disasters also appear to be getting worse and that's part a function of human growth, but also to some disasters, a function of human influence. The magnitude 7.0 earthquake that struck Haiti on January 12, 2010 was strong, but the catastrophic death toll of 100,000 to 300,000 (data varies) was because of the extremely poor economic situations and lack of building codes. 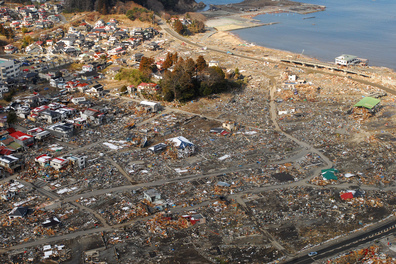 Whereas the magnitude 9.1 earthquake in Japan on March 11, 2011 that generated the tsunami was 100 times more powerful in terms of ground shaking, but the death toll was much lower at around 16,000. Still an enormous catastrophe, but not to the extent of Haiti. It appears that humans may be playing a part in the increased disasters related to weather and climate. Tornadoes, tropical storms, floods, droughts, and famines have always existed, but humans may be contributing to disruptions to weather patterns creating the ozone hole and variations in regional and global climates. Scientific data is showing that warmer oceans are beginning to rise due to glacial melt and thermal expansion, which will likely create more powerful tropical storms like we saw with Super Typhoon Haiyan. Overuse of available fresh water is causing many places to dry up and leading to the expansion of deserts called desertification. This in turn is creating an increase in epic famines like that was seen in Somalia between 2010 and 2012 that killed nearly 260,000 people. So the era of increased natural disasters is likely to stay and something humans will have to adapt too.